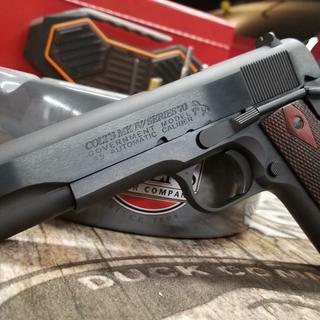 The Colt Series 70 Government is a classic full size 1911 pistol, reminiscent of the Colt pistols of the 1970s when the 1911 ruled the roost for semi auto duty and carry pistols. From its steel frame and side, to the checkered rosewood grips, this simple, easy to shoot pistol is a great addition to any collection. Great quality and of all 1911's currently on the market, it best represents a classic piece of American history. I love classic guns and the Colt 1911 is an American icon for handguns. Colt is iconic and this particular gun is historic. GAG had a great price and shipped in record time. Even during the holiday season. Thanks gag for such good customer service and a great firearm at unbelievable price. Very easy and quick process. Gun is beautiful. The only things I noticed is the pic of the wood makes the wood look a bit lighter than in person. I love it though. Save your money and get the real thing ... Colt! I was told that Colt doesn’t make a quality product any more and other brands are better. But the other brands aren’t a Colt. I am very happy with this gun, it’s only had 100 rounds through it so far but without a single jam, it’s all good. I did change hammer to a wider blade style for more comfort. I like the simple military design, I’m thinking this is my favorite for now. My first purchase of a new 1911, and also my first on-line purchase. The process worked great ! I used a listed FFL near me, couldn’have been easier. The gun itself is a beauty. Just had it at the range today to zero in a red dot sight and try out a couple Wilson magazines. Great fun ! Colt impresses me with the 1911 .45acp! What is there to say about probably the best gun design ever! This Colt Series 70 1911 is a pure joy to both handle and shoot. I have a WWII era that is my gun collection pride and joy. This one will now be the workhorse and primary carry weapon. Yeah it big, yeah it's heavy...but it's a knockdown drag out caliber. I bought some Wilson 500 mags for some extra capacity. If 17 rounds (2 mags)don't do the job then the Lord meant for me to come to the pearly gates. Unlike reviews I read about it before buying. The fitment & finish are very nice , especially for under $800 bucks. Standard GI sights are as accurate as I can be. I did put a small dab of glow in the dark Testor paint to aquire front sight faster in low light , and have no issues with this being the nightstand bump in the night weapon. GAG had a super price with free fast shipping to my FFL. You won't find a better more reliable weapon in this caliber in my humble opinion and I own Wilson's,NightHawk's and Wiley Clapp versions of 45. Keep her clean and run good ammo through and tou will never regret owning this fine firearm. This is just beautiful, a forged work of art. I've had it for a while now and it has performed flawlessly! Nothing like a Colt! Series 70 is the only way to fly. An excellent buy! I see that the price has gone up over $60 in the two weeks since I ordered mine. If you want one - better jump now! Grabagun service was great, no hitches. I received the firearm in a very timely manner. It would have been here faster except that the Dallas area was having record ice and snow. I had wanted this pistol for a long time. The Colt is stunning and fired with no problems at all. It had been very hard to find. Grab a Gun notified me when they had the Colt back in stock. I am very proud to have this Colt in my collection. Thanks to Grab a Gun's service and reasonable pricing I have my Colt. The Colt Series 70 Government 1911 epitomizes the simplicity and legacy of this iconic pistol. 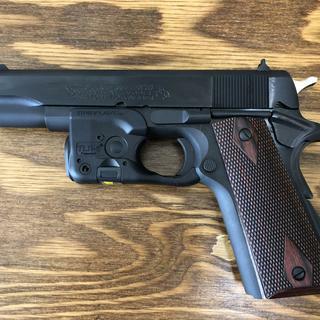 From its carbon steel fame and slide with traditional blued finish, to the double diamond checkered rosewood grips, this pistol is a throwback to the Colt pistols of the 1970s when the 1911 ruled supreme. With it's improved sights over the old GI models, and comfortable arched mainspring housing, this ergonomic and easy to shoot pistol is the perfect platform for slinging 230 grain .45 ACP hardball. Classic looks, great handling, and a timeless design, the Series 70 Government is a great choice for your next handgun.